Managers, Innovators, Pioneers, Executive Officers, Product Leads, Product Developers and More. 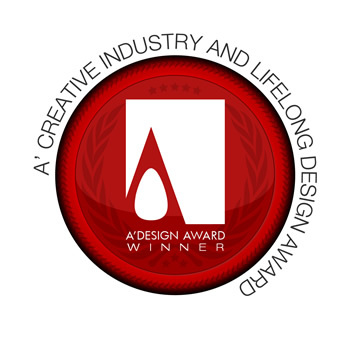 The A' Creative Industry and Lifelong in Design Award is a special design award category open to portfolio submissions of realized products created by non-designer professionals who are in charge of product development and innovation. Entries are accepted worldwide. Unlike other design competition categories, this category is for non-designers. The Creative Industry and Lifelong Design Award has been concieved to honor Managers, Innovators, Pioneers, Executive Officers, Product Leads, Product Developers and Designers who develop designs and products, as part of larger organizations. The A' Design Award for Creative Industry and Lifelong Design is not just an award, it is the indicator of quality and perfection in design profession, the award is recognized worldwide and takes the attention of design oriented companies, professionals and interest groups. Winning the A' Award is a certificate of excellence for managers and administrators. The winners of the Creative Industry and Lifelong Design Award are provided extensive and exclusive marketing and communication services to promote the success of winning the A' Award. Furthermore, the winning designs appear on the A' best designs book which is available worldwide, this book is furthermore distributed to the high-profile magazine editors, design oriented companies and relevant parties. The winning designs are also exhibited at our exhibiton, and the best designs will be picked for the permanent exhibition. The winners appear on magazines, newspapers, webzines and many other publishing mediums. For realized projects, having the A' Award gives added value to your products and separates them from the rest of commoditized goods, it is an excuse to communicate your product to the media, a reason for press releases. The best design porfolios are identified and best designs are selected from your design portfolio according to form, functional and emotional aspects of the product; the designs are considered for their degree of innovation, aesthetic qualities, functionality and usefulness in addition to ease of realization and realization efficiency, ergonomics and human interaction. The Lifelong Design Award, different from other design award categories do not consider a single design for judging. Your professional design portfolio will be evaluated as a whole. You must submit your porfolio, and your best 5 designs. You can send your existing designs from your porfolio or submit new designs. There is no time limit about when these designs were created. The portfolios of the professional participants are judged by our criteria that checks five key points: 1. Originality: Does your portfolio have a unique / individual design style with a distinctive personal vision and language in design i.e. are your works original and unique and different from the existing designs of other designers. 2. Consistency: Do you have a developed style of design that is commonly visible in most of your works. 3. Depthness: Are your designs well developed, do you make research before coming up with your designs, finding best practices, ergonomics details, material studies etc. when applies. (especially applies to industrial design portfolios) 4. Innovation: Do you find a new way to design, get inspired or be creative? Did you develop your own style (for example for artists) or technique? 5. Presentation: The way you present your designs and the overall composition of the portfolio. Furthermore, each of your designs will be evaluated by the jury based on the different category that they might be part of. To be eligible for this award, you should be a design professional or part of a company that practices the design as a profession (professional designers, design studios, design offices, design agencies, design companies, creative agencies etc.). Other companies are not eligible. Young designers, freelancers, students, architects, fresh graduates, young artists under 35 are not normally eligible. Only a single entry is allowed each year. Only a single entry per division/studio is allowed each year. The Aim of the Creative Industry and Lifelong in Design Award is to attract the attention of mass media, magazines, and industry leads to your business by means of creating publicity and dissemination and also to separate you from the rest of the actors in the industry by honoring your institution with a prestigious award. Award winners will be able to use a title that matches their nomination category: Such as "Creative Design Award Winner". Main Image* 3600 x 3600 pixels JPEG Your best product should be submitted. Optional Image #1 1800 x 1800 pixels JPEG Your second best-product. Optional Image #2 1800 x 1800 pixels JPEG Your third best-product. Optional Image #3 1800 x 1800 pixels JPEG Your fourth best-product. Optional Image #4 1800 x 1800 pixels JPEG Your fifth best-product. Documentation* Max. 40 x A4 Pages PDF Your portfolio of product designs, This portfolio will not be available online if you are a winner. You can submit up to 40 pages of PDF in A4 format. Video File Max. 10 MB. 45 Sec. AVI A video presentation of your portfolio. This will be available online.